For a long time now I’ve been wanting to overhaul my perfumes. 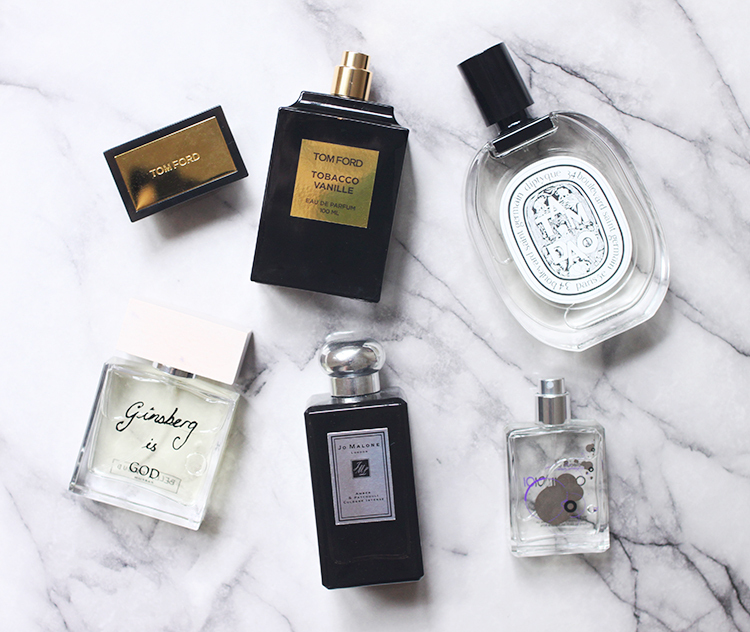 I think when I first got properly into perfume (around 2008) I didn’t realise how long it took to get through a bottle, and now that 8 or so years have passed, my tastes have definitely changed and I’ve honed in on the kind of thing I really enjoy and want to wear. Fragrance is definitely an investment, but I’ve found for years that it can positively influence my mood when I’m getting ready to go out, and there are definitely certain scents that I associate with certain coloured clothes or that I love wearing on special occasions. It can be a really subtle thing, but that’s why I love it so much. I should probably start by describing what I like in a fragrance and what all of these have in common. I'm into really masculine scents, think warm, spicy and woody over fresh, citrus or floral. My appearance is pretty classically feminine, i.e. long hair, makeup and in a skirt or dress 99% of the time, so I really like the contrast of wearing a masculine scent and the way the right fragrance paired with the right outfit makes you feel like a total badass. My two favourites have to be Tom Ford’s Tobacco Vanille and Jo Malone’s Cologne Intense in Amber & Patchouli. They’re both seriously expensive, but if they’re within your budget or you can save up for one of them, they’re 100% worth it. They both last really well on my skin and whenever I wear them I keep smelling myself all day or night and have never smelled anything so good in my life. Both of these are colognes which means they're actually unisex, and they'd probably smell just as good on a man as I think they do on me. One thing that I think is really important when you're not sure about a fragrance is to test it on your skin. It can be hard to know how long it's going to last or what it really smells like on you just from spraying it on a card in store, so if possible you should try and ask for samples before you invest your money, or at the very least have one particular fragrance in mind when you go in store and spray it on yourself and don’t mix it with anything else. I had actually smelled Tobacco Vanille on paper and found it underwhelming, but I was at the Tom Ford counter buying Tuscan Leather for my boyfriend’s birthday (because a) Tom Ford and b) baby boy Drake) and I spoke to the sales assistant about testing fragrances on your skin. Not only was she the loveliest person ever, but she walked me through the whole line picking out scents she thought I’d like based on what I told her I was after, and then she made me adorable little samples of the three I liked most (Tobacco Vanille, Oud Wood and London) so I could try them at home. But before Tobacco Vanille was Amber & Patchouli, which I temporarily forgot about in the wake of all my new fragrances which mostly came at the same time, but I wore it the other day for the first time in a while and was blown away by it again. I got Amber & Patchouli around the middle of 2015 and it was my absolute favourite for the rest of the year because it was my first step in the right direction. Jo Malone has a bit of a cult following in blog land, but none of the most talked about scents (Peony & Blush Suede, Blackberry & Bay, etc) were really my vibe. I’m on board with Wood Sage & Sea Salt but it still kind of lacks the punch I’m after, and that’s what Amber & Patchouli delivers. Apart from the two obvious notes, it also has a sandalwood base, along with cedarwood and guaiac wood. I don’t know what that last one is any more than the next person, but I do know that all the notes combined make up an incredible warm, heady scent that I absolutely love. Now Bella Freud's Ginsberg is God comes with a bit of a disclaimer, which is that I wanted either the perfume or candle before I'd even smelled them because Allen Ginsberg is one of my favourite poets, and he was best buddies with my absolute favourite writer and one of the loves of my life, Jack Kerouac. Fortunately for me, I also really like the scent, and it's to my taste much more than the candle because they smell completely different. The candle is very fresh with notes of fig and vine leaf, and while I still kind of want it just so I can keep the jar forever, the EDP is much more my speed. Again, it's unisex and contains notes of frankincense, wormwood, leather, black pepper and resin. The first time I sprayed it on myself it smelled immediately like wood smoke from an open fire, which I kind of loved. If this had a different name I may have been too intimidated by it, but the fact that it was named for Ginsberg means all shyness goes out the window because it was meant to be. Now if ever there were a beauty blogger sweetheart brand, it would be Diptyque. I found my favourite candle a while ago (Vanille, which is the most delicious, complex vanilla I've ever come across) but it took me a while longer to decide on a scent. I so wanted to love Eau Duelle because on paper it sounds like exactly my thing, but what I really wanted was for it to make me smell like the Vanille candle, which it doesn't. A lot of the popular Diptyque scents are very light and fresh, or the opposite of what I like, so after not loving the names I'd heard of but not wanting to stand at the counter and smell every single one, I took to Mecca's website and read the descriptions of each fragrance, made a shortlist and went in store to compare them. And that's how I came across Tam Dao, which has notes of amber, sandalwood, vanilla, spices and musk - I found the one! On me it smells spicy and smoky at first and then it dries down quite woody and I really enjoy it. If ever there were a controversial fragrance, Escentric Molecules' Molecule 01 would be it. With a slightly woody base, the charm of this perfume is that it's formulated with a note of one molecule that blends with your pheromones to create a scent that's totally unique to you. Some people say they get comments every time they wear it and others say they can't smell it at all, so I thought the 30ml travel size would be a reasonably priced way for me to find out. While I haven't worn this so many times yet that I've received tonnes of compliments, the first time I wore it a girl I work with asked me about it and now every time I wear it in the office she says she can smell it as soon as she arrives, even from several rooms away, so I guess it works on her! Again, this fragrance is unisex and if you're made of money you could layer it with another favourite perfume because I think the idea is that it's so subtle it may not necessarily register as perfume to other people, just like pheromones can have an effect without us being conscious of them. Either way, it's definitely an interesting talking point if you do get a comment on it, and the idea alone is enough to spark my interest.